For my Clue-themed cocktail party, I based one appetizer or dessert and one cocktail around each of the six murder suspects in the board game. Mr Green's appetizer was an easy choice - I needed something vegetable-based to complement the other heavier dishes like Mrs Peacock's Party Fowl Crostinis, and I love the flavor combination of basil and zucchini! This recipe was inspired by one I saw a little while ago at Little Broken, but I changed a few things. First, several of my other Clue recipes also feature cheese, and I wanted these nibbles to have more emphasis on the "green" part of their name, and less on the cream cheese. I therefore decreased the amount of cream cheese per zucchini spiral. Second, I wanted these to be easily and politely consumed with one hand while holding a cocktail in the other hand, so I added sticks for improved grip. Third, I don't own a barbecue - so I adapted this recipe for baking the zucchini in the oven. Preheat the oven for 450 F, and prep two cookie sheets with parchment paper. Slice the zucchini into 1/3 inch slices. They will lose water during baking, so careful that they are not cut too thin or they will become too delicate to assemble. 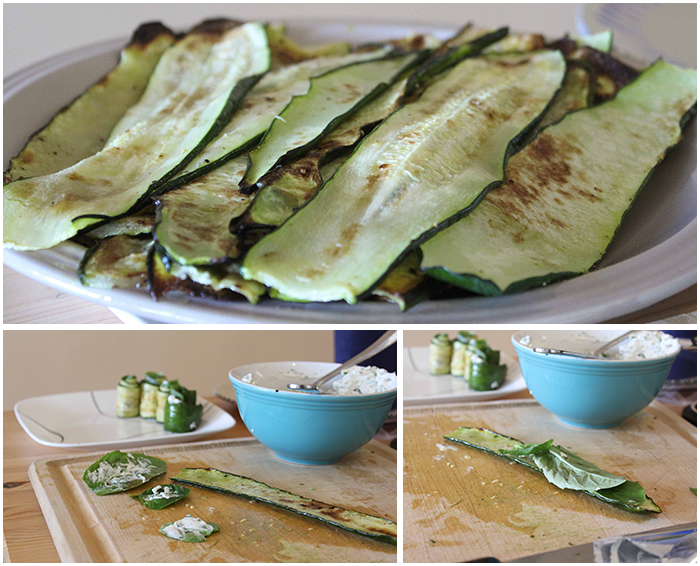 Lightly brush one side of each zucchini role with the olive oil, and lay oil-side down on the parchment paper. Sprinkle the zucchini slices with salt and pepper. Bake the zucchini for 15-20 minutes, or until golden brown (see above photo, top). Rotate cookie sheets halfway through. Meanwhile, combine the minced basil and parsley, the dill and the spring onions with the cream cheese, using a fork to mash and mix. Pinch the stems off the spinach leaves and remaining basil leaves - the stems poke through the zucchini and tear holes. Smear a small quantity of cream cheese onto two spinach leaves and one basil leaf per zucchini slice (see above photo, bottom left). This step prevents having to spread cream cheese on the zucchini, which I found to be difficult since the zucchini slices were fairly delicate and slick so the cream cheese slid off..
Lay the leaves cheese-side down onto one end of the zucchini (above photo, bottom right). 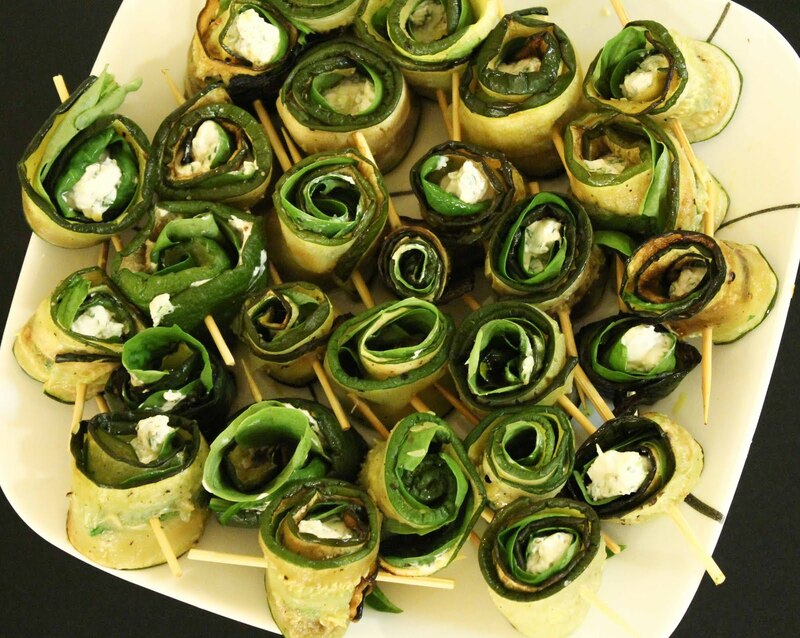 Roll up the zucchini, starting from the leafy side, and fasten with a kabob stick. Serve, or cover and refrigerate for a few hours.